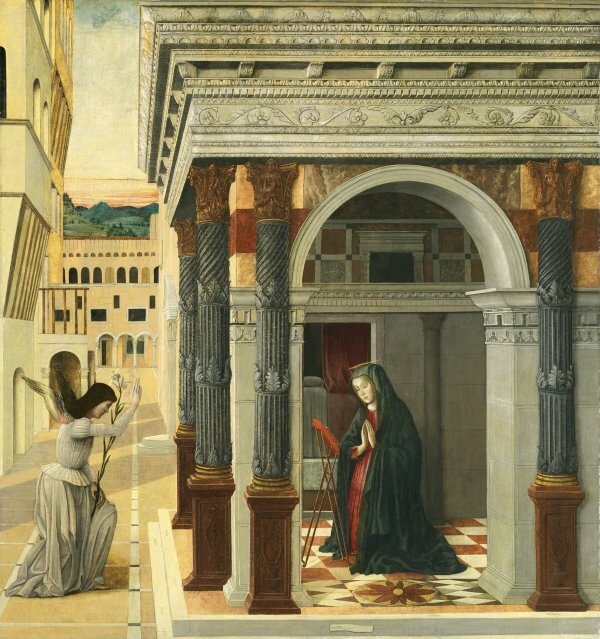 This panel of The Annunciation entered the Thyssen-Bornemisza collection from the British art market and seems to have previously been in a private London collection. 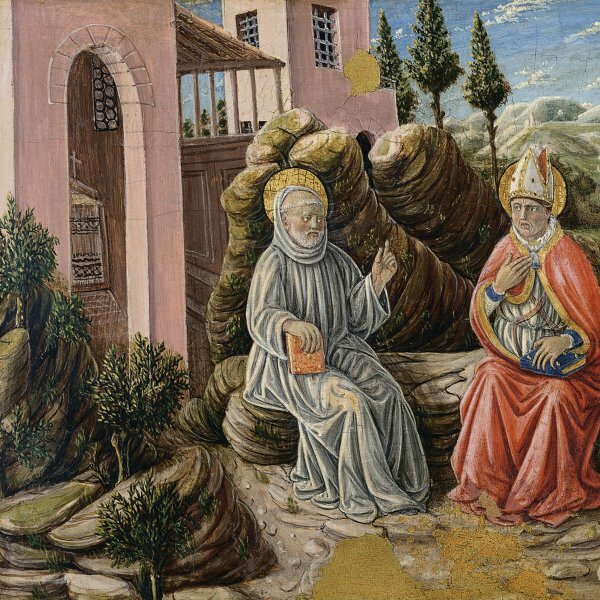 Roberto Longhi saw the work in London around 1929 at a time when it was thought to be by Domenico Morone, an attribution that he changed to Gentile Bellini.The attribution to the latter artist was confirmed by other experts including Van Marle and Suida.Van Marle dated the panel prior to 1465, and Suida prior to 1470. Nonetheless, Berenson rejected the idea and catalogued it as a work by Jacopo Parisatti da Montagnana, a follower of Andrea Mantegna, Bartolomeo Vivarini and the Bellini family. In his study of various Italian paintings in the Thyssen-Bornemisza collection, Philip Hendy attributed it to Giovanni Bellini, Gentile’s brother. Since it first appeared in catalogues of the Thyssen-Bornemisza collection in 1937 it has been considered to be by Gentile Bellini. The composition of this Annunciation is different to other, earlier ones in the collection, partly due to its setting, which takes the form of an empty city in which the Angel Gabriel delivers the message to Mary. The artist has naturally paid considerable attention to the depiction of the architecture that surrounds the two figures and which locates them in space. The Virgin, on the right, is kneeling in front of a slim, portable bookstand within a spacious portico decorated on the outside with an ornate entablature and fine attached columns. The angel kneels in the middle of a narrow, paved street that leads the eye back to a piazza with a portico whose façade acts as a screen but beyond which we can see a verdant landscape. Both the structure and the pronounced angle of the façades of the buildings function to emphasise the perspective and increase the sense of depth. In this complex construction various authors have detected the influence of the painter’s brother-in-law, Andrea Mantegna, more specifically his work on the frescoes of the Eremitani chapel in Padua in which the artist began his exploration of the illusionistic depiction of space. For the purposes of attribution and dating this panel has been compared with two other works by Gentile Bellini: The Blessed Lorenzo Giustiniani in the Accademia, Venice, formerly in the church of the Madonna dell’Orto in which the crisp profile of the sitter has been compared to that of the angel; and The Virgin and Child with Donors in the Gemäldegalerie, Berlin, in which the Virgin is comparable to the present one. With regard to the present work, Longhi referred to an Annunciation of 1486 by Carlo Crivelli in the National Gallery London, in which the artist used a setting and composition relatively similar to this one but with the addition of details and figures that give life to the city. The panel has a cartouche in the foreground in which the word “opus” can be clearly read.